In this article I am going to explain about File System Access Auditing and how to enable File System Access Auditing in Windows environment. Here, in some places we will refer File Access Auditing as File Server Access Auditing, File System Change Auditing and File Share Change Auditing, all the terms are equally interchangeable. In an every Organisation, sharing files and documents to their users through Network Environment is inevitable. For the security purpose we should give permission to access some kind of files and folders only to the specific set of users. However we can't give perfect permission to perfect users, in that case auditing file or folder access is inevitable for any organisation. the possible accesses are File Create/Add, File Delete, File Open, File Copy, File Rename, File Move, File Access, and File Permission change, and File Access failures. 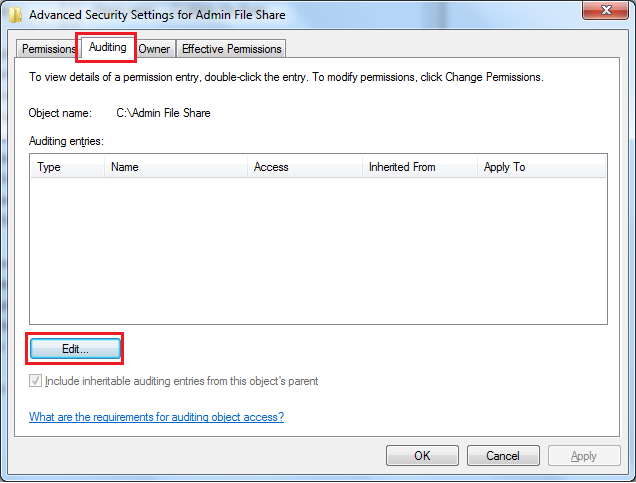 We can easily track these accesses by File Share Audit Event IDs which are controlled by the Audit Policy and File Security Audit. 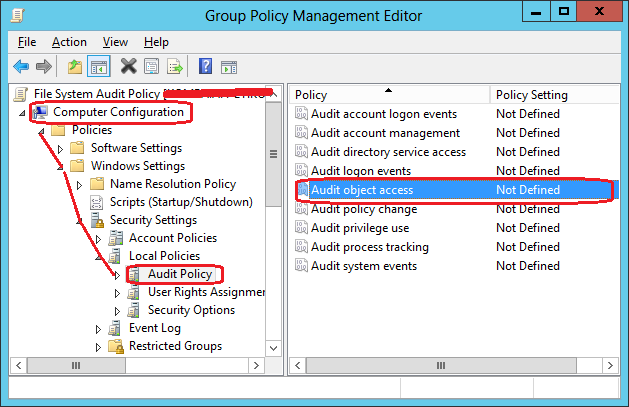 So to get these event logs you need to Enable Object Access Audit Policy and File Access Security Audit. 4656: This is the first event logged when an user attempts to access the file, this event gives information about what type of access was requested by the user and it will not give info about what type access actually made by user (which is given by the Event ID 4663), 4656 is controlled by the audit policy subcategory settings Handle Manipulation and File System. 4663: This event gives the info of what type actual operation is done by user on a file. 4658: This event get logged when user close the file, it helps to determine how long the file was open correlating this Event ID with earlier Event ID 4656 with the same handle ID. 4990: This event logged when an user opens a file . 4670: This event logged when user changes the permission of the file (security control list). The event contains the information, who changed the permissions, old and new permissions. 5145: This is a Advanced Detailed File Share event which is available only from Windows 7/ Windows Server 2008 R2 and later versions, 5145 is equivalent event id of 4656, it contains extra information like user's client machine (source machine) address and share path (network path) of accessed file. 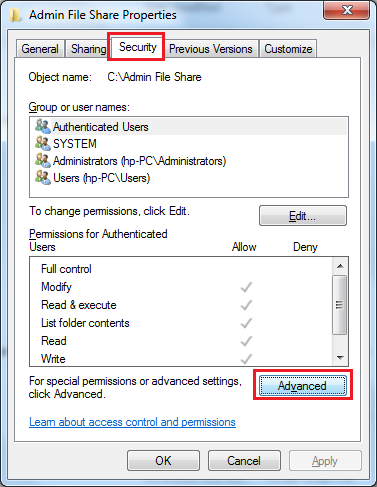 Note: You should also configure File Access Audit Security settings on the Folder which you are going to audit accesses. 1. 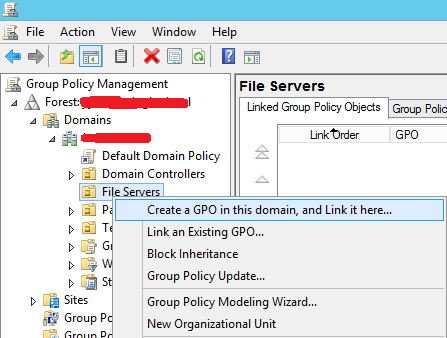 Open Group Policy Management Console by running the command gpmc.msc. 3. Type the new GPO name and click OK (Ex: File System Audit Policy). 4. Right-click on the newly created GPO, then click Edit. 5. 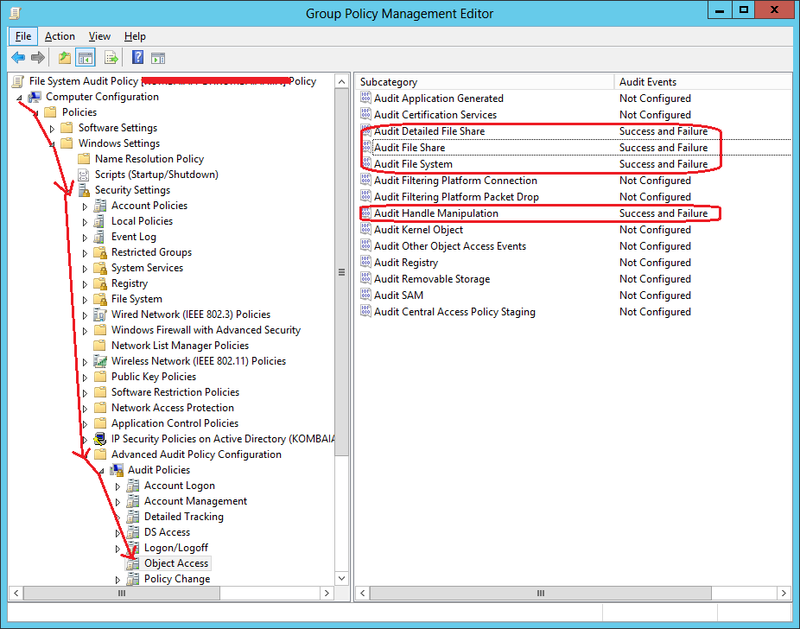 Expand the Computer Configuration, and go to the node Audit Policy(Computer Configuration->Polices->Windows Settings->Security Settings->Local Polices->Audit Policy). 6. In the left side pane, select Object Access, then double-click on this Setting. 7. In the opened window, check the values Success and Failure, the click Apply. Audit Detailed File Share, Audit File System and Audit Handle Manipulation. Note: The Audit Handle Manipulation setting controls the event ID 4656, it may be the noisy event for you. so if you don't want event 4656, leave the setting Audit Handle Manipulation as Not Configured. 10. Refresh or update the gpo by running the command GPUpdate/Force to apply this setting in the all the File Server which are inside OU File Servers. By the above steps, we have configured file access audit events for all the File Servers which are under OU File Servers, but in some cases, we may want to configure policy only for set of file servers. 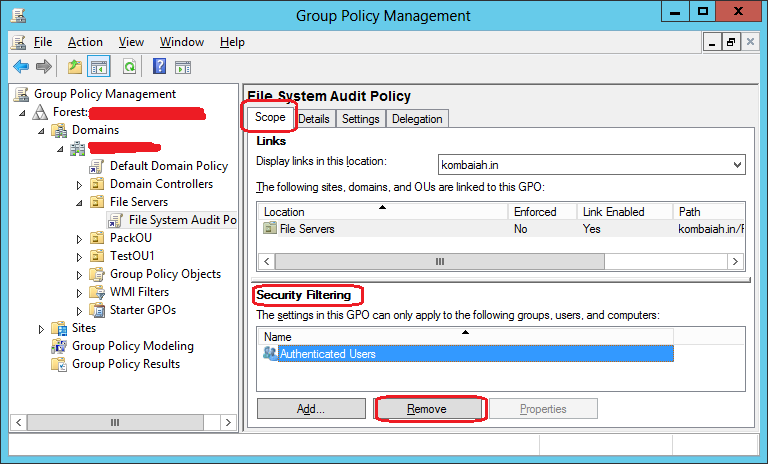 You can achieve this by Security Filtering of Group Policy. 1. Go to the tab scope, in Security Filtering section, select the entry Authenticated Users, and click Remove. 2. 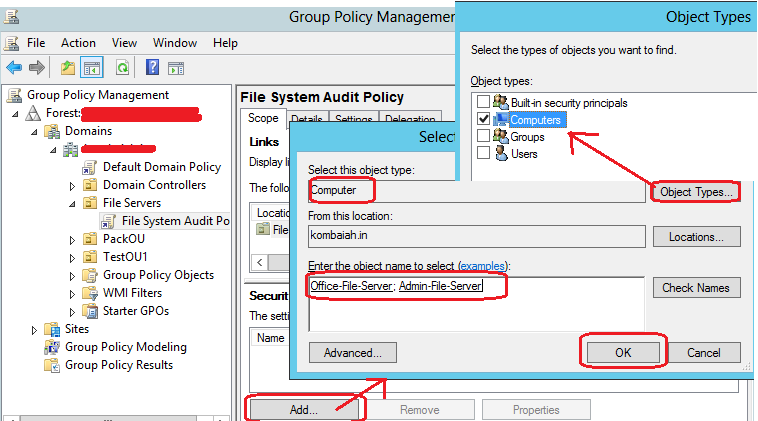 Click the Add button, click Object Types.. then check Computers, and select the computers (File Server Computer) which you want apply file system audit policy settings, and click OK to apply. 4. Refresh or update the gpo by running the command GPUpdate/Force to apply this setting in the all the selected File Servers. 1. 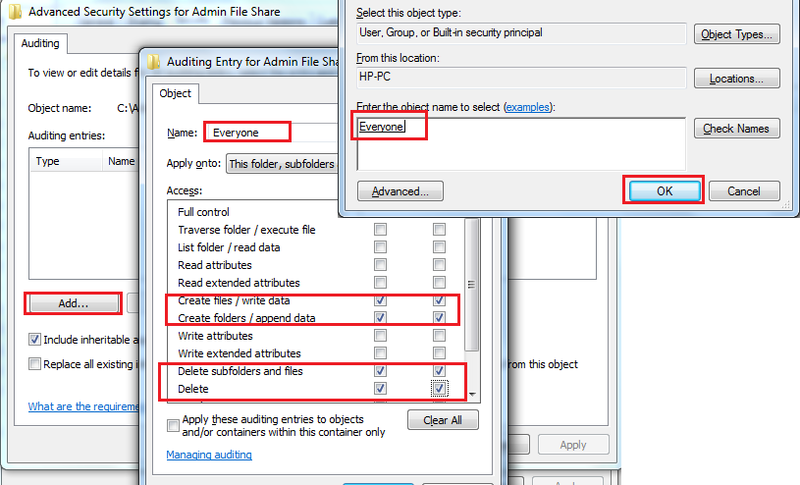 Right-click on the Folder which you want to configure audit events, and click Properties. 2. Select Security tab, and click Advanced button. 3. Navigate to the tab Audit, and click Add button. 4. Select the account Everyone, and check Successful and Failed Audit options which are you want to audit, click the button OK, and click Apply. Auditpol.exe is the command line utility tool to change Audit Security settings as category and sub-category level. It is available by default Windows 2008 R2 and later versions/Windows 7 and later versions. By using Auditpol, we can get/set Audit Security settings per user level and computer level. Note : This article is applies to Windows Server 2003, Windows Server 2008,Windows Server 2008 R2, Windows Server 2012, Windows 7 and Windows 8. 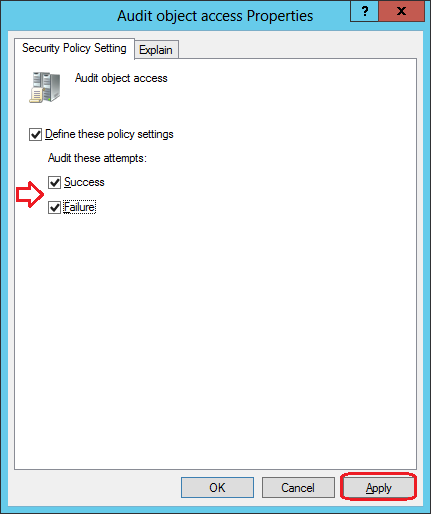 I have read your guide and this one http://blogs.technet.com/b/askds/archive/2011/03/11/getting-the-effective-audit-policy-in-windows-7-and-2008-r2.aspx. I have on local level a working solution, but when files arrive from over the network nothing happens. Do you have a clue why this could be? 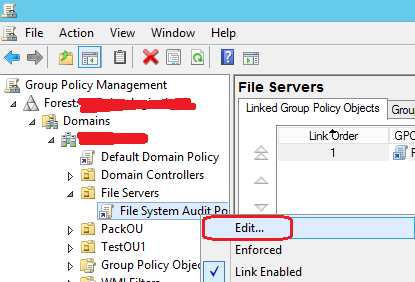 Do you configured Security Audit Policy on the network folder? Thanks for answering, I use the same "shared" folder. So I thought that auditing enabled for everyone on succes and failure did the trick. Is there a special auditing setting for files coming from another pc? Indeed this setting revealed to me that a file is placed in the shared folder. Maybe I can work with that. Can you think of a reason why localy 4663 shows but not comming from a network? I find it even more puzzeling because on another server, which is of the same brand and number and even configuration it works. As I know, there is no hidden setting....the event 4663 is the sub category event of local file system audit. so it doesn't care about network...but the event 5145 is detailed file share event which contains network information...do you have any problem with 5145? If someone attempts to access a file that they did not have permission too, would it generate an audit failure 4663? If not, is there an event ID that is generated when a failed attempt to access/modify a file or folder. Handle manipulation was no help. U will get only the failure event 4656 in this case. Thanks for the quick reply. There were thousands of 4656 instances while handle manipulation was turned on. Do you have any recommendations on how to cut those down or other audit tactics that could track failures to modify files? Thanks for finally writing about >"Enable File Access Auditing in Windows" <Loved it!